As I begin my classes for a new semester, I am reminded of an event last year that shook the nation. 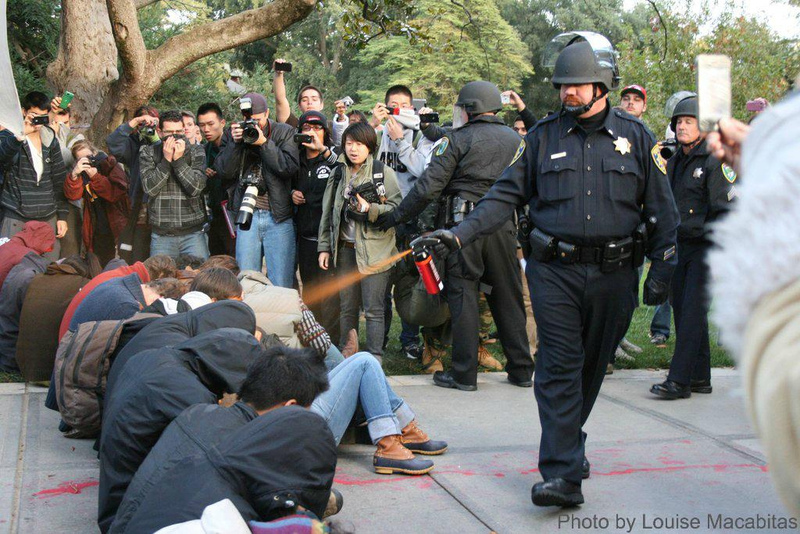 This infamous picture of UC Davis cops pepper-spraying Occupy protesters makes you angry. When you look at it, you feel outrage toward the arrogant police officers responsible for attacking non-violent students. That is, until you watch the full video that makes you consider again what the events of this day were. In the Lariat’s editorial “Police Shouldn’t Pepper Spray Peaceful Protesters” published last Thursday, the author reflected a poor knowledge of the true facts surrounding the event at UC Davis, instead repeating the false rhetoric so widely circulated by the Occupy Movement. The article states, “The videos show a sickening display of unnecessary police force against a group of students simply expressing their views.” That is dreadfully misleading. Take note of this brief overview of the actual events that occurred at UC Davis. The day before, Nov. 17, campus police sent out emails and warned students that all tents on campus would be removed the next day. UC Davis is fully within its rights to ban students from camping out in the middle of campus for obvious health and safety reasons. On Nov. 18, hundreds of students ran around the university in the name of “free speech,” banging on classroom doors and screaming, “We are the 99 percent!” Causing as much of a disruption as possible, the protesters eventually gathered in the field, where, as they had warned, the police began confiscating the tents and arresting only the students who refused to leave their tents. In the video, we then see hundreds of protesters surround the police completely, screaming “F*** the police.” They begin making demands, threatening, “We will not let you leave unless you let our friends go.” The circle refuses to part, trapping the officers inside of hundreds of screaming students. The actual event depicted in the popular picture took place as a police car tried to get to the scene to take the arrested students away. The students refused to move, blocking the car outside and the police inside their circle. An officer spoke to the students in the way, telling them directly that unless they let the police car through, they would be pepper-sprayed. After multiple warnings, the students responded with cheers and anger. Surrounding the police and threatening them was not “a simple expression of views.” The police were trying to leave the scene – but the students trapped them, knowing exactly that they would be able to manipulate the public to believe exactly the position of the Lariat’s article. Am I saying that pepper spray was the only option? Perhaps not. Perhaps the officers could have dragged the students out of the way of the police car. Either way, I am not saying that the officers necessarily made perfect choices. However, it needs to be noted that the students involved in this protest were far from “peaceful”. Regardless of whether you agree with the police officers’ response, glorifying the rebellious and disruptive actions of these college students is similarly destructive. Well done. You’ve cracked open the story that lies beyond the sound bite. I was working only a couple of hundred feet from the quad that day, quite oblivious to the matter. It wasn’t at all uncommon to hear drums and cheering outside. Periodic protests over rising tuition had been going on for the past couple of academic years. When I got off work, I snapped a couple photos, but by then all I caught were some arrestees going into the back of a cop car. You might enjoy this commentary I posted in response to the event. It’s crazy to think you were right there in person for all of this. I’m glad you stopped by again!